Paleo-Tethys Ocean -- n. A large ocean that originated between eastern Gondwana, Siberia, Kazakhstan, and Baltica in the Ordovician and finally closed in the Jurassic; replaced by the Tethys Ocean as eastern Pangea was assembled. paleobiology -- n. A field of science that uses biological studies of living organisms to answer questions about the evolution and physiology of extinct organisms. paleoherb -- Any member of a group of basal flowering herbs which may be the closest relatives of the monocots. They include the water lilies, Piperales, and Aristolochiales. paleosol -- Soil horizon from the geologic past. Pannotia -- n. A supercontinent that existed in the Late Precambrian and gave rise to the continents of Gondwana, Laurentia, Siberia, and Baltica in the Cambrian. Panthalassic Ocean -- n. A vast ocean that existed from the Late Precambrian to the Jurassic, circling the globe and connecting to smaller oceans that developed throughout the Phanerozoic; also known as the Panthalassa. papilla(e) -- Cellular outgrowths. These look like little bumps or fingers on the surface of cells. parapodia -- A sort of "false foot" formed by extension of the body cavity. Polychaetes and some insect larvae have parapodia in addition to their legs, and these provide extra help in locomotion. parasite -- n. An organism that lives on or within a host (another organism); it obtains nutrients from the host without benefiting or killing (although it may damage) the host; parasitic- adj. ; parasitism- n. a type of symbiotic relationship in which one organism benefits and the other does not. parataxonomy -- n. The grouping of organisms based on common morphology; does not imply evolutionary relationships. For example, fossil eggs can be assigned to parataxons without any knowledge of which specific organism produced them. parenchyma -- A generalized cell or tissue in a plant. These cells may manufacture or store food, and can often divide or differentiate into other kinds of cells. pathogenic -- Organism which causes a disease within another organism. peat -- n. A deposit of partly decayed plant remains in a very wet environment; marsh or swamp deposit of plant remains containing more than 50 percent carbon. pedipalps -- The second pair of appendages of cheliceromorphs. In many arachnids, such as spiders, the pedipalps are enlarged in the male and used for copulation. pelagic -- Pelagic organisms swim through the ocean, and may rise to the surface, or sink to the bottom. They are not confined to live on the bottom as benthic organisms do. peptidoglycan -- carbohydrate polymer cross-linked by proteins. It is found in the cell wall of Gram positive bacteria, where it stains with the dye crystal-violet. perennial -- A plant which continues to grow after it has reproduced, usually meaning that it lives for several years. perianth -- The sepals and petals of a flower are together called the perianth; literally "around the anthers". More info? peridinin -- carotenoid pigment found in dinoflagellates. periphyton -- Dense strands of algal growth that cover the water surface between the emergant aquatic plants. Spirogyra is commonly responsible for this growth. peristome -- A set of cells or cell parts which surround the opening of a moss sporangium. In many mosses, they are sensitive to humidity, and will alter their shape to aid in spore dispersal. permineralization -- Fossilization process that occurs when minerals, carried by ground water, enter and harden in the pores of an organism’s structures. petal -- One of the outer appendages of a flower, located between the outer sepals and the stamens. Petals often display bright colors that serve to attract pollinators. More info? Phanerozoic -- n. The geologic eon that includes the interval of time from approximately 543 million years ago to the present, comprising the Paleozoic, Mesozoic, and Cenozoic eras. pharyngeal slits -- Characteristic of chordates, pharyngeal slits are openings through which water is taken into the pharynx, or throat. In primitive chordates the pharyngeal slits are used to strain water and filter out food particles; in fishes they are modified for respiration. Most terrestrial vertebrates have pharyngeal slits only in the embryonic stage. pharynx -- Cavity in the digestive tract just past the mouth itself. May be muscularized for sucking or swallowing in various animals. phloem -- Nutrient-conducting tissue of vascular plants. phosphate -- an ion consisting of a phosphorus atom and four oxygen atoms. Among other things, it is used in the constuction of nucleic acids. photic zone -- Region of the ocean through which light penetrates; and the place where photosynthetic marine organisms live. photosynthesis -- biochemical process in which light energy is absorbed by chlorophyll, and is used to fuel the building of sugar molecules. phragmoplast -- The cell plate formed during cell division. phycocyanin -- blue, water-soluble pigment found in the cyanobacteria and the red algae. phycoerythrin -- red, water-soluble pigment found in the cyanobacteria and red algae. phylum -- n. A category in the hierarchy of animal classification between class and kingdom; phyla- pl. phytomelanin -- a papery "sooty" black layer over the seed of plants in the Asparagales, which includes agaves, aloes, onions and hyacinths. It is an important character for defining the group. phytoplankton -- Tiny, free-floating, photosynthetic organisms in aquatic systems. They include diatoms, desmids, and dinoflagellates. pigment -- any colorful compound, used by living things to absorb or block sunlight, and in sexual displays. More info? 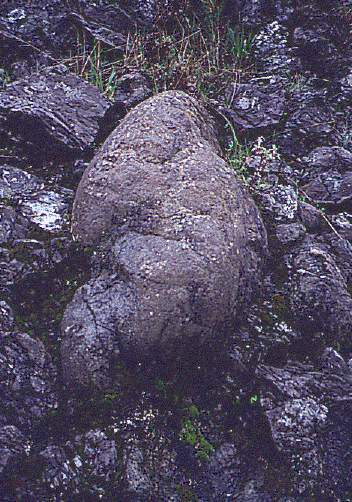 pillow lava -- Lava extruded beneath water characterised by pillow-type shapes. pinnately compound -- Leaves which are divided up like a feather are said to be pinnately compound. pistil -- The central set of organs in a flower; it is composed of one or more carpels. More info? pith -- To severely damage the brain of a frog, also any central region of parenchyma tissue within a plant stem. pits -- Thin regions of the cell wall in xylem conducting cells. Their structure is an important characteristic for recognizing different kinds of wood. placenta -- n. In mammals, a tissue formed within the uterus through which nutrients are passed from the mother to the embryo (and later the fetus) and its wastes are removed. It is analogous to the protective membranes in the egg of other amniotes. placental n. A mammal that gives live birth to well-developed young that have prolonged embryonic development within the mother’s uterus. Marsupial mammals also have a placenta, but the embryo spends less time developing in the uterus before birth. Placentals include animals as diverse as humans, elephants, dogs, and mice. plankton -- n. Very small, free-floating organisms of the ocean or other aquatic systems, including phytoplankton, which produce their own nutrients through photosynthesis, or zooplankton, which get their nutrients from organisms. plasma membrane -- Outer membrane of a cell, sometimes called the cell membrane. The term plasma membrane is used more frequently when discussing prokaryotes. plasmid -- Circular loop of DNA in prokaryotes. Eukaryotic DNA is organized into chromosomes. plasmodesmata -- Cytoplasmic connections between neighboring cells in plant tissues. plasmogamy -- A process of fusion of the cytoplasm of two cells; the first step in syngamy. plastid -- Any of several pigmented cytoplasmic organelles found in plant cells and other organisms, having various physiological functions, such as the synthesis and storage of food. plate -- n. Rigid parts of the Earth's crust and part of the Earth's upper mantle that move and adjoin each other along zones of seismic activity. The theory that the crust and part of the mantle are divided into plates that interact with each other causing seismic and tecotnic activity is called plate tectonics. platyspermic -- Having seeds which are flattened and disc-like. Contrast with radiospermic. pleurae -- In trilobites and other arthropods, pleurae are elongated flat outgrowths from each body segment, that overlie and protect the appendages. plicate -- Folded like a paper fan, as in the leaves of palms, cyclanthoids, and some orchids. pluton -- n. Any body of igneous rock that solidified below the earth’s surface. plutonic -- Applies to igneous rocks formed beneath the surface of the Earth; typically with large crystals due to the slowness of cooling. Synonym of intrusive. Antonym of volcanic. pollen -- The microspore of seed plants. pollen tube -- In seed plants, the extension of the male gametophyte as it emerges from the pollen grain in search of the female gametophyte. pollination -- Process of transferring the pollen from its place of production to the place where the egg cell is produced. This may be accomplished by the use of wind, water, insects, birds, bats, or other means. Pollination is usually followed by fertilization, in which sperm are released from the pollen grain to unite with the egg cell. pollinator -- Animal which carries pollen from one seed plant to another, unwittingly aiding the plant in its reproduction. Common pollinators include insects, especially bees, butterflies, and moths, birds, and bats. pollinia -- A mass of fused pollen produced by many orchids. polymer -- a large molecule constructed from many smaller identical units. These include proteins, nucleic acids, and starches. pore -- Any opening into or through a tissue or body structure. precocial -- adj. Describes young that are mobile and fairly self-sufficient at birth. Precocial young are generally well-developed (and large) at birth, born with their eyes open, and able to walk. Chickens and grebes are examples of precocial birds; sheep and guinea pigs are examples of precocial mammals. predator -- Organism which hunts and eats other organisms. This includes both carnivores, which eat animals, and herbivores, which eat plants. prey -- Organism hunted and eaten by a predator. primitive -- adj. Refers to a character or feature in a group of organisms that is inherited from a common ancestor. Teeth are a primitive characteristic of birds since birds inherited them from their dinosaur ancestors. proboscis -- Elongated organ, usually associated with the mouth. The proboscis is an important feeding appendage in echiurans. producer -- Any organism which brings energy into an ecosystem from inorganic sources. Most plants and many protists are producers. prokaryotic -- Literally "before the nucleus", the term applies to all bacteria and archaea. Prokaryotic cells have no internal membranes or cytoskeleton. Their DNA is circular, not linear. protein -- class of biochemical compounds constructed from amino acids. Proteins may be structural, such as those that make up hair and cartilage, or they may be reactive, such as the enzymes. proteinaceous -- describes any structure which is composed of protein. protostele -- When a plant's vascular tissue develops in a solid central bundle, it is said to have a protostele. See also siphonostele and eustele. pseudoelaters -- Moisture-sensitive cells produced in the sporangium of hornworts. pseudopodia -- Fingerlike extensions from an amoeboid cell; literally "false feet". pteridophyte -- Plant in which the sporophyte generation is the larger phase and in which the gametophyte lives an existence independent of its parent sporophyte. Pteridophytes are almost all vascular plants, and include the lycophytes, trimerophytes, sphenophytes, and ferns. pteridosperm -- An extinct group of seed plants which bore fern-like leaves. pupa -- In metamorphozing insects, a stage between the larva and adult during which the organism undergoes major developmental changes. pycnoxylic -- Wood in which there is little or no parenchyma tissue among the xylem is called pycnoxylic. Conifers and flowering plants have pycnoxylic wood. Contrast with mannoxylic. pygidium -- In trilobites, the posterior division of the body, formed by fusion of the telson with one or more posterior pleurae.